Under a contract with Loral Skynet Satellite Services, Space Systems/Loral (SS/L) has built and launched three new-generation communications satellites, Telstar 5,6 and 7. Launched in 1997, Telstar 5, is the highest capacity satellite in the U.S. telecommunications industry. The three spacecraft will serve the United States, southern Canada, Mexico, and the Caribbean. Since the satellites are delivered in orbit, SS/L assumes complete responsibility for launch services and risk management. The hybrid Telstar 5 and Telstar 6 are each outfitted with 24 C-band and 28 Ku-band transponders and generate a total of 3200 watts of on-board transmitter power. Telstar 7 carries 24 C-band and 24 Ku-band transponders but use more powerful components to provide identical rf power. Lightweight composite materials and highly efficient techniques for dissipating thermal energy and for generating and storing electricity allow for a substantial increase in the spacecraft abilities, with almost no increase in size and weight. The three geostationary Telstar spacecraft are based on SS/L's three-axis, body-stabilized 1300 platform. SS/L's 1300 buses are designed to achieve long useful orbital life - in this case 12 years - through use of a bipropellant propulsion system and a momentum-bias system for excellent stationkeeping and orbital stability. Solar arrays and nickel-hydrogen batteries provide uninterrupted electrical power. Loral anounced in July 2003 a definite agreement to sell Telstar 5, 6 and 7 to Intelsat, who operated the satellites now as Intelsat Americas 5, 6 and 7. Intelsat changed the name of the Intelsat Americas satellites to Galaxy 25, 26 and 27 effective to 1 February 2007. 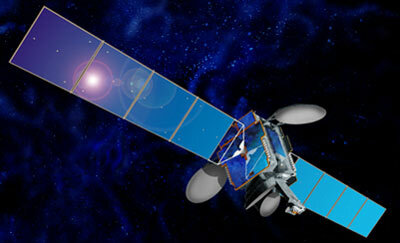 Telstar 6 suffered a control processor failure in 2001, but no service loss occured. Intelsat Americas 7's electrical-distribution system suddenly failed on 28 November 2004. Contact was regained a few days later, with 22 transponders returning to operation. Galaxy 26 reached its operational end of life on 7 June 2014, when the final command was sent. Galaxy 27 was retired in 2016 and was moved into a graveyard orbit above the geostationary belt.